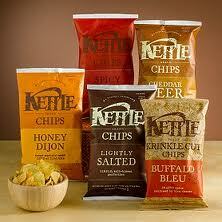 Enter to Win 1 of 5,000 Cases of Kettle Chips! Wow! Click here and fill out a simple form to be entered to win 1 of 5,000 cases of Kettle Chips! Winners will be notified via email about 2 weeks after contest is over.